Kâtip Çelebi. [كشف الظنون عن أسامي الكتب والفنون] Kashf al-zunun ʿan asami al-kutub wa-al-funun] Kitab kashf al-zunun ʿan asami al-kutub wa-al-funun li-Mustafa ibn ʿAbd Allah al-shahir bi-Hajji Khalifah wa-bi-Katib Jalabi; ʿuniyah bi-tashihuhu wa-tab`uhu `ala nuskhat al-mu’allif mujarradan `an al-ziyadat wa-al-lawahiq min baʿdihi wa-taʿliq hawashihi thumma bi-tartib al-thuyul ʿalayhi wa-tabʿiha Muhammad Sharaf al-Din Yaltaqaya wa-al-muʿallim Rifʿat Bilkah al-Kilisi. [Istanbul : s.n. ], 1941-1943. [K.]. N.B. A pdf version of this book is available online with addendums by other authors. Brockelmann, Carl. Geschichte der arabischen litteratur. 2 vols. plus 3 suppl. vols., Leiden, E.J. Brill, 1943-. [GAL.] MELA also published Guide to Using Carl Brockelmann’s Geschichte der Arabischen Litteratur; Ghazali is in: g, I: 534-546 (PDF: 1943); s, I: 744-756. (PDF: 1937). There were two translations of this book published. One by dar al-maʿarif in Egypt which we have a complete copy in pdf files. Download all the files found in this directory to get the full benefit of the cross references tags among the pdf files. Zirikli, Khayr al-Din. Aʿlam : qamus tarajim li-ashʿhar al-rijal wa-al-nisaʾ min al-ʿArab wa-al-mustaʿribin wa-al-mustashriqin / taʾlif Khayr al-Din al-Zirikli. (Bayrut : Dar al-ʿIlm lil-Malayin, 4th printing: 1979.) (PDF: Ghazali article) – Complete book is online in pdf files. ʿUmar Riḍa Kaʾḥala’s Muʿjam al-muʾlafin (Beirut: Muʾsast al-risala, first printing, 1993); Ghazali is in: vol 3. pp 671-673 #15766. Complete edition is available in pdf format. There is also another edition (Dimashq, al-Maktabah al-ʿArabiyah, 1957-1961.) in 15 volumes. 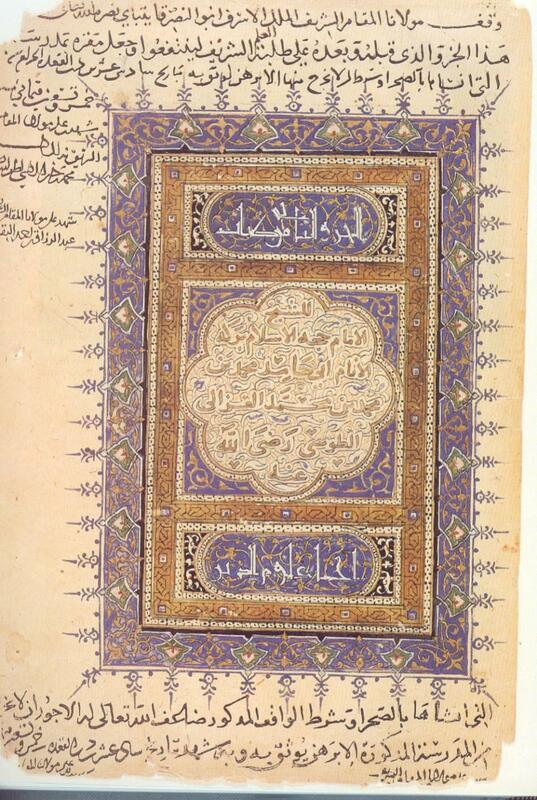 Here is a list of 608 Ghazali manuscripts that are in Turkish Libraries. The list is in excell format with the local call numbers. 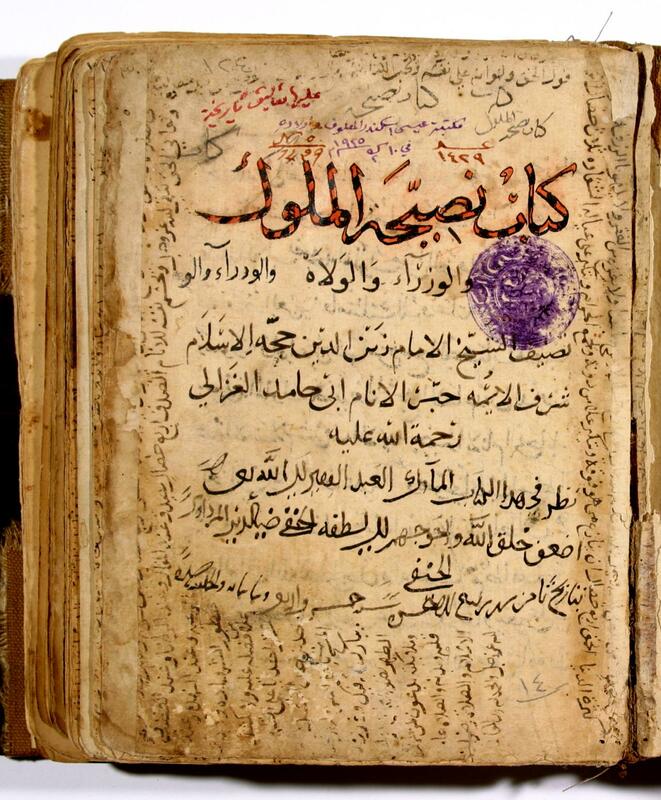 As it is only a list it only lists the name of the title of the Manuscripts in Turkish and in Arabic. There are 2 by his brother Ahmad and 32 by Shi’hab al-din (d. 1123). Excel file. 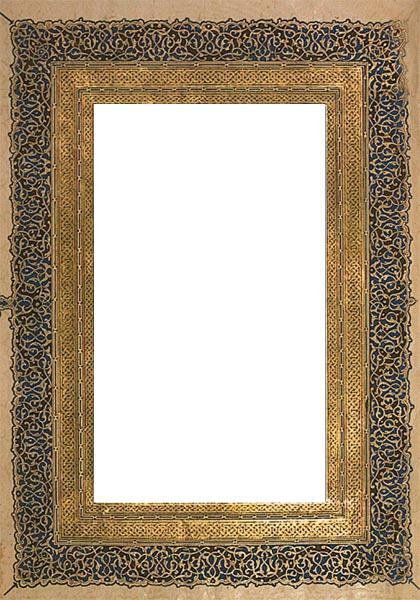 This file is based on a search of Union Catalog of Turkish manuscripts. The Turkish mss website that I used to generate this list has gone offline! However I believe that it has re-surfaced in another format elsewhere and I just can’t find it. From Arabic Books and Manuscripts, Journal of the American Oriental Society, Vol. 83, No. 4. (Sep. – Dec., 1963), pp. 452-457. From Arabic Books and Manuscripts I: Pseudo-A?ma’î on the Pre-Islamic Arab Kings, Journal of the American Oriental Society, Vol. 69, No. 2. (Apr. – Jun., 1949), pp. 90-91. From Arabic Books and Manuscripts II: Kindîana, Journal of the American Oriental Society, Vol. 69, No. 3. (Jul. – Sep., 1949), pp. 149-152. From Arabic Books and Manuscripts III: The Author of the Gurar as-siyar, Journal of the American Oriental Society, Vol. 70, No. 3. (Jul. – Sep., 1950), pp. 181-182. From Arabic Books and Manuscripts IV: New Fragments of as-Sarakhsî, Journal of the American Oriental Society, Vol. 71, No. 2. (Apr. – Jun., 1951), pp. 135-142. From Arabic Books and Manuscripts V: A One-Volume Library of Arabic Philosophical and Scientific Texts in Istanbul, Journal of the American Oriental Society, Vol. 75, No. 1. (Jan. – Mar., 1955), pp. 14-23. From Arabic Books and Manuscripts VI Istanbul Materials for al-Kindî and as-Sarakhsî, Journal, of the American Oriental Society, Vol. 76, No. 1. (Jan. – Mar., 1956), pp. 27-31. From Arabic Books and Manuscripts VII: Some Graeco-Arabica in Istanbul, Journal of the American Oriental Society, Vol. 81, No. 1. (Jan. – Mar., 1961), pp. 7-12. From Arabic Books and Manuscripts VIII As-Sarakhsî on Love, Journal of the American Oriental Society, Vol. 81, No. 3. (Aug. – Sep., 1961), pp. 222-224. From Arabic Books and Manuscripts XII: The Arabic Translation of Artemidorus, Journal of the American Oriental Society, Vol. 85, No. 2. (Apr. – Jun., 1965), pp. 139-144. From Arabic Books and Manuscripts, XIII-XIV, Journal of the American Oriental Society, Vol. 95, No. 2. (Apr. – Jun., 1975), pp. 209-213. From Arabic Books and Manuscripts, XV, Journal of the American Oriental Society, Vol. 99, No. 1. (Jan. – Mar., 1979), pp. 91-93. From Arabic Books and Manuscripts, XVI: As-Sarakhsi (?) on the Appropriate Behavior for Kings, Journal of the American Oriental Society, Vol. 115, No. 1. (Jan. – Mar., 1995), pp. 105-109. Türkiye yazmalari toplu katalogu = The union catalogue of manuscripts in Turkey / T. c. Kültür Bakanligi Kütüphaneler Genel Müdürlügü. Ankara : Kütüphaneler Genel Müdürlügü, 1979-. In volume 5, p. 616, it lists the following numbers for al-Ghazali: 67, 514, 544, 550-551, 574-575, 1397-1398, 1433, 1455, 2519, 2627, 2630, 2654-2655, 2674, 2725, 2726, 2744-2757, 2783, 2817, 2878, 2880, 2883, 2928-2929, 4078, 4116. For example: 4078 is qasidah al-munfirajah and 4116 sharh janat al-Isma’. Not sure they are authentic works but you’ll find them listed in catalogs. N. B. This is also available in facimile pdf online. Also noted is a website that should supercede this as the Turkish gov’t sponsered digitization effort is underway. I have tried very often to register with the site to no avail. Danishgah-i Tihran. Kitabkhanah-‘i Markazi va Markaz-i Asnad. Fihrist-i Kitabkhanah-‘i ihda’i-i Aqa-yi Sayyid Muhammad Mishkat bih Kitabkhanah-‘i Danishgah-i Tihran. [Tehran]: Chapkhanah-i Danishgah, 1330- [1951 or 1952-]. Escorial. Real Biblioteca. Bibliotheca arabico-hispaña escurialensis; sive, librorum omnium mss. quos arabicè ab auctoribus magnam partem arabo-hispanis compositos bibliotheca coenobii escurialensis complectitur, recensio et explanatio, operâ & studio Michaelis Casiri … Matriti, Antonius Perez de Soto, 1760-70. Oscar Löfgren and Renato Traini. Catalogue of the Arabic manuscripts in the Biblioteca Ambrosiana, by Oscar Löfgren and Renato Traini. Vicenza : N. Pozza, [1975- Series: Fontes Ambrosiani ; nuova ser. 51, 66. Contents: v. 1. Antico fondo and medio fondo.–v. 2. Nuovo fondo, series A-D, nos. 1-830 — v. 3. Nuovo Fondo: Series E (Nos. 831-1295). v. : col. ill. ; 31 cm. Choix de livres qui se trouvaient dans les bibliothèques d’Alep (au XIIIe siècle) [Le Caire, 1946] . Catalogue of the Arabic and Persian manuscripts in the Oriental Public Library at (Bankipore) Patna. Patna : Superintendent, Govt. Print., Bihar, 1908-1994. v.1 – v. 36. Sufism is volume XIII (Arabic MSS.) 1928. Pages related to Ghazali (PDF). N.B. The catalogs are online. Arberry, A. J. The Chester Beatty Library. A handlist of the Arabic manuscripts, Dublin, E. Walker (Ireland), 1955- v. 1. MSS. 3001 to 3250.–v. 8. Indexes, by U. Lyons. v. plates. 26 cm. Bibliothèque nationale, Catalogue des manuscrits arabes … Bibliothèque nationale, Département des manuscrits. Paris : Bibliothèque nationale, 1972- 2. ptie. Manuscrits musulmans (5 v.) — index (1 v.). 25 cm. E. Blochet, Catalogue des manuscrits arabes des nouvelles acquisitions (1884-1924) par E. Blochet … Bibliothèque nationale (France). Département des manuscrits Paris, E. Leroux, 1925. 2 p. ., xi, 424 p. 25 cm. Nico van den Boogert. Catalogue des manuscrits arabes et berbères du Fonds Roux (Aix-en-Provence) Nico van den Boogert. Aix-en-Provence : IREMAM, 1995. 126 p. ; 22 cm. Series: Travaux et documents de l’IREMAM, no 18. Mohammed ben Cheneb. Catalogue des manuscrits arabes conservés dans les principales bibliothèques algérienes … Alger, Jourdan, 1907-09. [v.1] Médersa de Tlemcen, par A. Cour.–[v.2] Grande mosquée d’Alger, Par mohammed ben Cheneb. 2 v. in 1. 28 cm. Y.S. ʿAllush wa-ʿAbd Allah al-Rajraji, Fihris al-makhtutat al-ʿArabiyah al-mahfuzah fi al-Khizanah al-ʿammah bi-al-Rabat al-Fath (al-Maghrib al-Aqsá) : al-qism al-thani, 1921-1953, iʿtaná bi-taʾlifihi Y.S. ʿAllush wa-ʿAbd Allah al-Rajraji. al-Rabat : Matbuʿat Afriqiya al-Shamaliyah al-Fanniyah, 1954-1958. 2 v. ; 25 cm. Matbuʿat Maʿhad al-Abhath al-ʿUlya al-Maghribiyah ; al-juz’ 58, 63. ʿIsam Muhammad al-Shanti, al-Makhtutat al-ʿArabiyah allati sawwaraha al-Maʿhad min Dar al-Makhtutat fi Sanʿa’ (al-Jumhuriyah al-ʿArabiyah al-Yamaniyah) fi al-fatrah min 28/1-4/3/1985 / iʿdad ʿIsam Muhammad al-Shanti. al-Tabʿah 1. al-Kuwayt : Maʿhad al-Makhtutat al-ʿArabiyah, al-Munazzamah al-ʿArabiyah lil-Tarbiyah wa-al-Thaqafah wa-al-ʿUlum, 1988. 60 p. ; 24 cm. Arabskie rukopisi Vostochnogo otdela Nauchnoi biblioteki Sankt-Peterburgskogo gosudarstvennogo universiteta : kratkii katalog / sostaviteli O.B. Frolova i T.P. Deriagina ; redaktor O.B. Frolova. Sankt-Peterburg : Izd-vo TSentr “Peterburgskoe Vostokovedenie”, 1996. Series: Arkhiv rossiiskogo vostokovedeniia. 268 p. : ill. ; 22 cm. Wilhelm Ahlwardt: Verzeichniss der Arabischen Handschriften der Königlichen Bibliothek zu Berlin. 1-10. Berlin, 1887-1899. (Handschriften-Verzeichnisse. 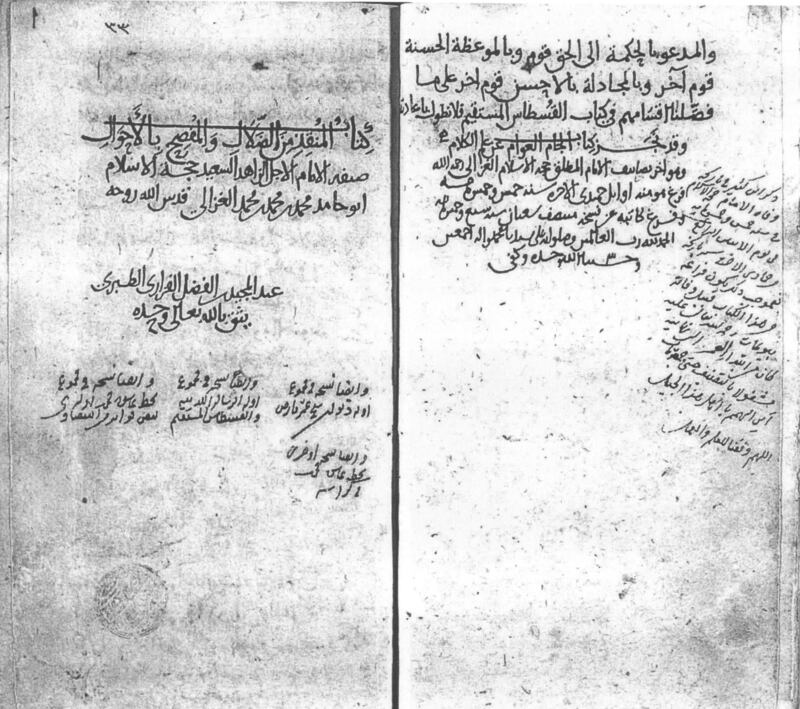 7-9, 16-22) Sample of Ghazali’s entries in Volume 2 as well as listing from vol. 10 (PDF) Some volumes are online googlebooks. Hars Kurio: Arabische Handschriften der “Bibliotheca orientalis Sprengeriana” in der SBPK. Berlin, Freiburg, 1981. (Islamkundliche Materialien. 7). For more information on Islamic manuscripts that are held at libraries in Germany see Staatsbibliothek zu Berlin’s Oriental collections. Illuminated page from the Ihya’ Source unknown. 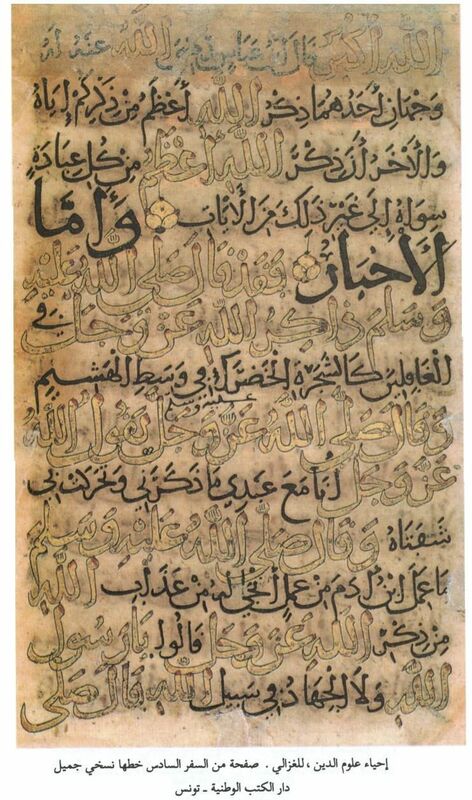 Illuminated page from the Ihya’ from Tunisia‘s Dar al-kutub al-waṭniya (National Library). Kimya’ saadat at the University of Chicago.